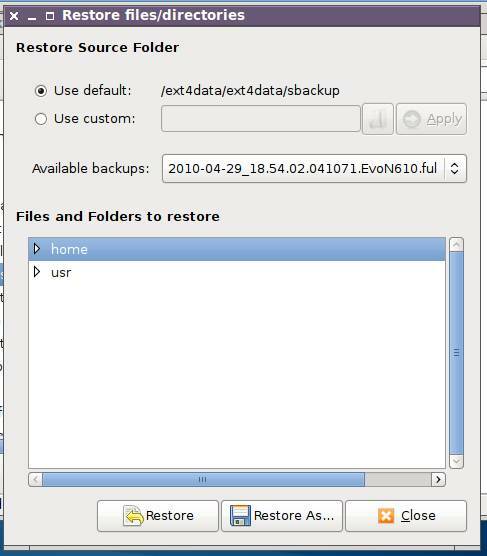 Simple Backup consists of two separate programs: Simple Backup Config (which configures and performs your backups) and Simple Backup Restore. 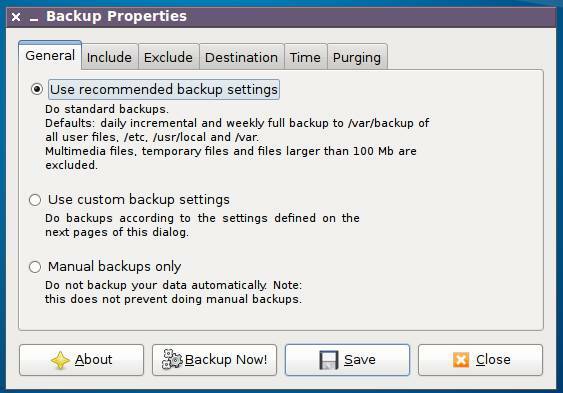 The Backing-up part has a simple tabbed interface. Exclude - specify files and directories to leave out the backup set (defined by Include), by path, file-type wild-cards, regular expressions or maximum size. 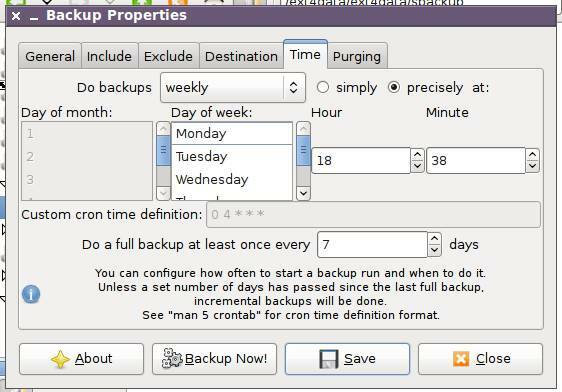 Time - the backup frequency down to specific scheduled hour and minute. Purging - this is the housekeeping tab to specify which backup sets to delete, either on aged-expiry or 'Logarithmic' which retains a backup set from each period, decreasing with age. On each tab there is a 'Backup Now!' button to initiate a backup job. This creates a scheduled cron job which kicks in at whatever time you specify, so the Now! part means 'use whatever the current criteria are across the parameter tabs.' Cron then takes care of running the job. I set a full backup running on the Compaq which cranked through 1.3Gb of data in a little over five minutes. What this generates is a backup folder named after the job you specified : (2010-04-29_18.54.02.041071. EvoN610.ful), date-time stamped and sequence numbered, with the machine name and backup type. In this folder is a collection of files which describe the backup and the machine state - file-list, partitions list, excludes list, a package list (all the deb's on the machine) and most importantly, the backup archive file itself, files.tgz. It's a standard .tgz archive with full file and folder paths specified. I can use it with any archive manager, not just Simple Restore. This archive naming is the only dumb thing Simple Backup does - why not name the .tgz file the same as the folder? 2010-04-29_18.54.02.041071.EvoN610.ful.tgz is far more meaningful and useful to me than just files.tgz! 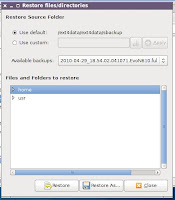 The Restore application is even simpler, consisting of a single window for specifying the backup set location, the set to use and either 'Restore' or 'Restore As...' if you wish to restore the backup to a different location from the original. Restore unwinds your .tgz file as fast as your archiving engine allows - in my case just over three minutes for 1.3Gb.